Roman Catholic Cop: Christmas is Coming!! There are only 80 days until Christmas!!! Or to be more specific, as of 9:00 am on October the 6th there are 1912 hours. You can get an exact countdown at this site. Why am I bringing up Christmas in early October? Well, according to local merchants I'm already a month late. They have had Christmas stuff up since Labor Day!! Actually, the real reason is because Sunday I was teaching confirmation. We were talking about the baptism of Jesus. By "we" I meant the instructors. Evidently, the table in the back of the room was talking about when Jesus was born. The question eventually came to the forefront and I told them I would do some research and find out for them. 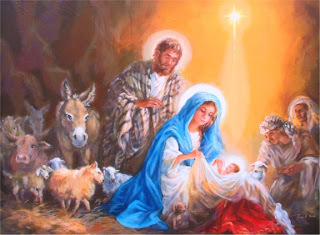 The truth of the matter is that no one really knows when Jesus was born. There are numerous theories as to why the Catholic Church chose December 25th to celebrate the birth of Jesus. The most accepted is that it was during the pagan solar festival Natalis Invicti and what a better way to bring pagans into the faith than by having celebrations on the days that they are already used to celebrating. I think those that try to say that Jesus was actually born some other time of the year are just saying so to bring some conspiracy theory or discredit to the Catholic Church but that's just a theory of mine. The fact of the matter is that believing that Jesus was born on December 25th isn't a matter of faith. If you want to believe that he was born in July or September or May it doesn't matter. The Church gave us this holiday to remember that God loves us so much that He became man so that we might have eternal life. It's also important to remember that Christmas isn't even THE major holiday of the Church. That would be Easter. It is said that Jesus is the reason for the season. Well, Easter is the reason that Jesus became man. So don't forget to celebrate Easter. In our materialistic society it seems to get forgotten.